Pearl Jet | Marston, Thompson & Evershed, Plc. Aroma is Barley, salt, kale. Dark color, thin looking. Small white head. Taste is toasted barley, coffee, vinegar. Thin feel, more like a porter than a stout. Appropriately, this is probably a good beach stout due to the thin texture, but a bit weak on flavor." Pours as black as coal, with thin (very thin) dark beige head. Not the creamy head of a guiness, but a thin oily head. Aroma is dark chocolate and prunes. Taste is chocolate, burnt toast, wood and dried fruit. Overall weight is medium, with oil, slick feel to it. AT first I was not impressed, but his is getting better with each sip. 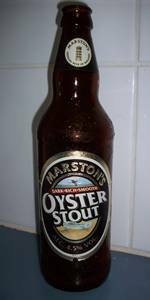 Marston's Oyster Stout isn’t actually made with oysters but takes its name from the food of choice for poor English folk, and why Stout? Because Stout is the favoured style of the downtrodden workers of the UK. So in effect this brew is Marston’s homage to the proletariat of Britain. Anyway, history lesson out of the way - is it any good? We shall soon see. Poured from a 500ml bottle into a nonic pint (the working class glass of choice). A: Presents an opaque dark brown loose packed 2 cm tan foam head which slowly recedes leaving a half centimetre lather on top. Judging by the head it looks a bit thin bodywise... nothing like those lovely dense nitro Stouts, oh well. 6/10. S: Aroma hits you with Marmite and dark fruits (a bit of prune mostly). Following this is a hint of molasses, walnut and a herbal note towards the end. Overall this Stout reminds one of brews like Theakston Old Peculier - but a bit more muted in the aroma. That was a tasty brew, let’s hope Oyster Stout has some of that magic. 8/10. T: Flavour is decent but let down by texture [shhh! We’ll get to that next]. Forward with the dark fruit/Marmite/molasses characters, mid palate comes on more chocolate than the expected walnut, and the finish is dry and slight herbal bitterness. The flavour profile is clean and easy-going, great we like that. 7/10. M: Here is where Oyster Stout is let-down: Too watery. I understand that Stouts can be watery at the ≤ 4.2% ABV mark, but this is a brew at 4.5% needs less of this characteristic. Ironically the body itself is mid to light as you would expect and the carbonation is a classic UK pub light-borderline-flat. 5/10. D: Overall this beer is a decent English stab at a Sweet Stout. The dark fruit slant makes it taste more like the progeny of an Old Ale and Stout, which at least gives it a place in this overcrowded beer market. Some lactose or oats would really help out the body, but apart from that this is an easy-drinking OK Stout. Availability and price aren’t great here in Australia, if this was canned (with nitro), easily accessible, and cheaper it would definitely be a regular beer in my fridge... that’s a freebie there for Marston’s (you can thank me with beer). 7/10. Food match: “Oysters” way too obvious... beef casserole with crusty bread - there! Would not come close to being my favourite drop , by any means , but I cannot guzzle Rochefort 10 , or Courage Imperial Stout all night . This nice brew went well with..... Chili! Pearl Jet from Marston, Thompson & Evershed, Plc.